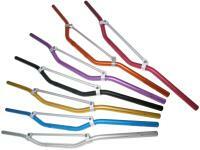 Motocross MX aluminium handlebars supplied as shown. The left end of the handlebar is knurled to ensure optimum grip on the rubber handlebar grip. Standard size handlebar so no separate mounting kit required as the existing clamp can be used. Racing Planet USA carries a wide selection of Scooter, Moped, Motorcross, and Motorcycle Custom Tuning products. To see our full selection of VICMA Scooter parts please select VICMA from the manufacturers list.